Made in the USA from high-impact plastic, the Gunslinger threads onto your belt. 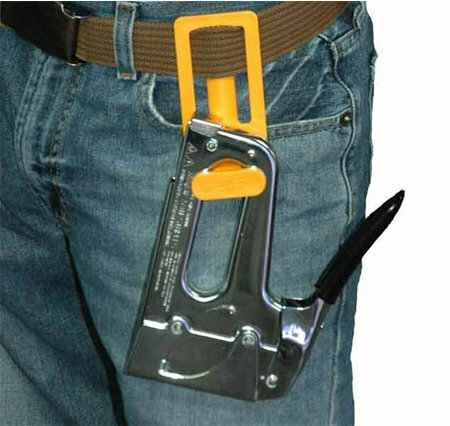 Its design makes it easy to “quick draw” your stapler, yet prevents the stapler from slipping off accidentally. CableOrganizer.com ships the Gunslinger to your door — if you live in the lower 48 — for $7, or you could go with Amazon and pay $5 but get gouged another $8 for shipping. I think that staple gun needs to come with a safety. I like the concept. I would suspect that if it’s made by Arrow, they may be adding it as a freebie at some later date – buy a few boxes of staples or a new stapler and get it as a “bonus.” $7 seems a bit procey for a piece of molded plastic. $4 would seem closer to a realistic price. HF will get some from China for about that price soon – probably. I have recommended for year to my congressman to get legislation for staple guns to have trigger locks.. remember people staple people, guns dont. A message from the NSRA – national Staple-Rifle Association. It’s probably unlawful to pack a loaded stapler in California. Unless you have a concealed stapler permit. Just great… now every two bit punk will be packing a stapler…. Don’t like the idea at all. Stapler hangs too low and bangs about on the legs – can’t stand that and it would catch on attic hatches etc. Also would not help where I tend to lose staplers … crawling through those same attics and crawlspaces. I’ve found keeping it in the Al Bundy position (under the belt) works best. Might be okay for putting up vapor barrier, but I prefer the hammer type stapler for that job. No packing a stapler for me. I’ll pack a Texas Flashlight. When I got started in films, where just aboiut every trade and craft on set uses a staplegun for something, the first rule I learned the hard way was: If you need the gun, you need to reload it; take a box of staples. I am gobsmacked that arrow went thru all this design and manufacturing exercise without making a place to hold at least the next load. If it held a box, it’d give you a place to store the belt clip too.